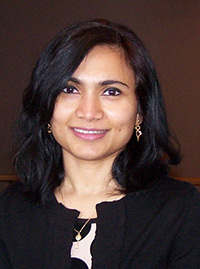 Dr. Rukhsana Ahmed’s research embraces the cross/trans/inter-disciplinary nature of communication scholarship, with specific focus on exploring the role of communication processes in improving health outcomes among marginalized communities and promoting broader social changes in international health contexts. She is particularly interested in the ways in which systems of beliefs, values, actions, and symbols are shared, or not, by people and how social groups influence communication in health care interactions. She is also interested in the ways in which people’s cultural selves become entwined with race, ethnicity, gender, and social class groups and shape their perceptions of health, illness, and health care. Although her research is deeply rooted in health communication, Dr. Ahmed is also actively involved in interdisciplinary and multisectoral projects and partnerships in other realms of communication, including immigrant integration, multicultural media, and religious diversity. Philosophy of Translation Translation and Copyright Intercultural Communication and Mediation Social Translation Islam and Secularism, Western Islam, and Religion in the Public Sphere Muslim Activism, Islamism and Religious Pluralism Quran Translation and Interpretation. Areas of expertise: Islam religion and interfaith dialogue. Raúl Ernesto Colón Rodríguez is a PhD in Translation Studies and Part-time professor at the University of Ottawa. He had worked (French-Spanish and English-French) in editorial, cinematographic, Canadian Francophonie and United Nations translation areas in Canada (2007-2019). He completed in 2011 a Master’s degree in TS at the University of Ottawa, and since 2011 he had published chapters, articles, translations and book reviews in American, Canadian, Spanish, Colombian, Polish and Brazilian publications. His PhD Thesis with Complexity Theory as theoretical approach, was about Collaborative Activist Translation 2.0 in Canada. He also does research on the links between Translation, Exiles and Migrations of Latin-Americans in North America. Questions of intercultural communication, medias' representation of ethnic minorities; cultural identity, racism, racialization, and cultural history in Canada and in Black Africa. Media strategies of civil society actors (including Twitter and Facebook); Representation of protests and civil society in the media; Media events (e.g. the Olympics, Eurovision, Super Bowl etc.) and the "media eventisation" of society; Consequences of living in a media-saturated society; Media and international Development; Representation of suffering; Journalism; WikiLeaks; Trial of Bradley Manning; Protest Camps; Occupy movement. Expertise in Canadian literature as well as in comparative literatures (with special emphasis on European literatures); another area of specialization is international cinema (especially Russian, Polish, and Yiddish). The PhD equivalent in Russian was dedicated to the theory of literary titles; the PhD in English was on Leonard Cohen's philosophy of time. The current research project focuses on the conceptualization/construing the 18th century in international film and popular culture. Sub-categories for "Communications and media"